Comic Book Resources has compiled their list of the "Top 100 Comics of 2011," which could double as my "to read" list. So, as a reminder to myself, I'm reblogging the list here, with a couple of comments on what I've read, and what looks good. I've read Jim Woodring's psychedelic "Congress of the Animals," a twisting wordless tale that's ultimately a love story. I haven't yet read Chester Brown's "Paying For It," but it sounds intriguing -- or painful (it's hard to tell). Also tempting yet perhaps painful is Mark Waid's "Irredeemable." On the other hand, "Darkwing Duck" is just pure fun. I've read the intro to "Archive Meets Kiss," but I'm not sure it's one of the best of 2011 -- I'll have to check it out. It's interesting that OMAC comes in at #52 on the list -- coincidence? And finally, "A Tale of Sand" written by the late Jim Henson of Muppet fame looks interesting. I gave my wife a copy of Sarah Oleksyk's book "Ivy," and I also read the online version. The art is so engaging, and the story equally endearing. The other comic that I've read from this list is almost the complete opposite: "Chew." As the blurb says, "Layman and Guillory's insane tale of a cop who can read the history of any food he eats" is a cool premise, skillfully done. From this section two books that I particularly want to read are "Pepper Penwell & The Land Creature of Monster Lake" and Carla Speed McNeil's "Finder:Voice." I saw McNeil at Portland's Stumptown Comics Fest, but I failed to get a copy of the Finder book at the time. Unfortunately I haven't read any of the comics in this area. Ray Fawkes' "One Soul" is sitting on top of my "to read" pile right now, so I'm looking forward to that. Also, I've been following Vera Brosgol on twitter, and I'm eager to read her work of a teenage girl who's picks up a friendly specter that slowly turns scary in "Anya's Ghost." Out of the top 10, most of CBR's selections are superhero series. There are three exceptions, all interesting. I've read some of Kate Beaton's "Hark A Vagrant" online, and new stories of "Love & Rockets" is always a good thing, but Craig Thompson's "Habibi" is the oyster's pearl here. It's a massive work, years in the making, and a turning point for Craig Thompson. I've read it twice, but I feel I need to read it again before making any further proclamations. Looking over this list, I evidently need to read a lot more comics. When I was a kid I read a comic-book story that completely baffled and amused me. Not a big deal, since I was often baffled & amused by comics, but this story has stuck with me. It's the story of Snowboy, by Dan Decarlo, originally printed in Archie's MadHouse Comics #22. Snowboy's origin is a bit unclear, but his situation is he's a high-school student that's a bit different: he's a snow man. At first every one gives him the cold shoulder, but as he shows his sense of humor they start to warm to him. A pal sets him up with a blind date, a girl named Dagmar, and their relationship grows into true love. The more time Snowboy spends with Dagmar, the more his love grows, until finally "the warmth of Dagmar's love did something for Snowboy" -- it melted his snowy exterior revealing a normal teen-ager. Unfortunately, when he arrives at Dagmar's house she's become a snow girl. This is a basic love story, and a teen coming-of-age story, wrapped within a science fictional setting, presented as an Archie comic. What's not to find amusing and baffling about that? It's an excellent example of the types of stories one would find in any issue of Archie's Mad House Comics. 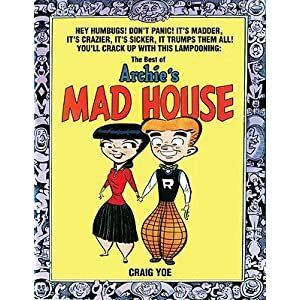 Now a set of these comics has been edited and reprinted by Craig Yoe, in a hardcover book called "The Best of Archie's MadHouse" published by IDW Books. The volume is a hefty 200 pages, reprinting more than 60 gag pages and stories, and includes about a dozen Mad House covers, and some original art. If you're unfamiliar with MadHouse comics, they were from Archie, but separated in a distinct way. Archie Comics were interesting but predictable - mostly based around various love triangles with the characters of Archie, Betty, Veronica, Reggie, Jughead, Moose, Ethel, Midge, and Dilton. MadHouse comics were utterly unpredictable, starting with the Archie characters, adding spoofs from popular music, movies and TV, and letting the Archie artists run wild. Similar to Mad Magazine, but some might say even more unconventional. Like a MadHouse comic book, "The Best of Archie's MadHouse" is split into sections. The Teen Age Section reprints some of the earlier Archie-centered gags, as well as the other mid-60s jokes on pizza, rock'n'roll music and dating. Probably the highlights of this section are the stories with Lester Cool and Chester Square. I found it interesting that in these stories Lester Cool is the disrupter, and also usually the victor. Nowadays the stereotype is that the "nerdy" underdog Chester might be the hero of the story. The Monster Section gives the artists a chance to spoof the horror movies of the day. "The Son of Dr. Jerkyll" is another Twilight Zone-ish story by Dan DeCarlo where the hero attempts to give himself the face of Elvis facsimile Melvin Prestone. That story impressed me enough years ago that it is as clear in my memory as it is when I re-read it in the collection. Other mad scientists appear in this section, such as Dr. Syklops, Boris Karlaff, and a hippie version of Frankenstein's monster, but the most memorable original character from this section is probably Sabrina, the Teen-age Witch. The "Way Out" section is a grab-bag of oddball stories of mermaids, cavemen and "The Discovery of Sleep." The best story from the "Outer Space" section is from my favorite Little Archie artist, Chic Stone. He takes a stock story of a Martian prince named Zyx on a reconnaissance mission to Earth before the invasion, and provides a wonderfully goofy and artistically rendered "Tale of Wail." Archie comics originally started out as the MLG group, publishing superhero comics such as "The Shield" and "The Black Hood." "The Good Guy" section gives the Archie artists a chance to recall these heroes, and mix it up with a goofball hero (who nevertheless gets the job done) called Captain Sprocket. When I was a kid I loved these stories, although as an adult I find them less interesting than the other sections. They have a Shaggy Dog tale feeling to them, without any plot twists or character depth. What I like about this book is that it gives people a chance to read the old MadHouse comics without breaking the bank. Buying a set of MadHouse digest reprints off eBay would probably cost about $5-$10 per issue. "The Best of Archie's MadHouse" brings it all together for $34.99 (I found it for as little as $20 on Amazon.com). I also appreciated Yoe's introduction, although I felt it was a little light on meaty material. That's a complaint I've had about other Yoe projects, such as his book "The Bizarre Comics of Boody Rogers." Another thing I learned is that Dan DeCarlo looks like his drawings, for example Snowboy. There's a photo of DeCarlo in the introduction, and you can see it in the chin, the hair, the smile. I also liked that each excerpt showed which Madhouse issue it came from, as well as the artist and publication date. Some people, however, may find this information is printed too small. There are a couple examples of original art in the book, but I would have liked to have seen more. Yoe has his own quirks in designing books, and a couple of them show up here. All the page numbers are printed upside down, which may be a goof or a joke. Also, the cover has some faint comments embossed on it: "Don't read this" "Don't read this either." Yoe asks the readers if we would like to see more MadHouse, so it seems as if he's planning a series of reprints. In all, "The Best of Archie's MadHouse" is a great introduction or reading copy for a collection of MadHouse stories. If you're looking for more depth into the background of the artists, the stories, or the Archie publishing group, you'll be disappointed. But, if you want an affordable way to see for yourself the madness that was MadHouse, buy this book. In this cold world of ours, the goofy love you find for MadHouse comics might melt your snowy exterior.